Vision: Engaging youth to grow closer to God and transform our world through a process of becoming more like Jesus! Need to find a permission slip? Click on the link and download the document. Want to learn more about our church and the ministeries we offer? Click the link below to learn more. Join us for Sunday School each Sunday morning from 9:30 am to 10:15 am! 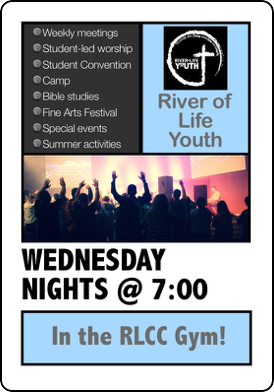 Our Youth Group meets each Wednesday night at 7:00 pm. Student-led worship, a fun atmosphere, relevant messages and a place where you belong! Engaging youth to grow closer to God and transform our world through a process of becoming more like Jesus.